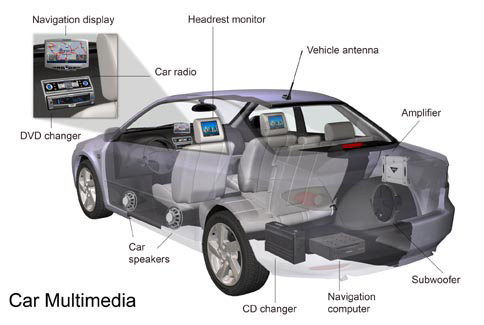 In-car multimedia provides a valuable means for a manufacturer to differentiate its vehicles from competitors. In the automotive industry, manufacturers are facing a challenge. Consumers are increasingly expecting their new cars to incorporate up-to-date audio and multimedia systems, and interfaces for their portable devices such as MP3 players. With the consumer electronics industry changing at a faster pace than the traditionally slower rate of the automotive industry, the carmakers and tier 1 suppliers must find ways to keep up. Software flexibility is critical for automotive applications because media formats and communications standards are in a constant state of change. This means that general-purpose processors are often a good choice, as they allow easy, cost-effective changes to automotive multimedia systems. The Audi A5 system is a good example of a modern in-car multimedia system. 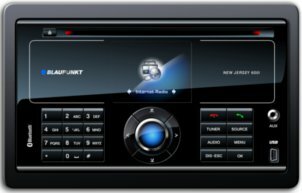 Incorporating up to four Blackfin processors, it provides a digital audio broadcast (DAB) radio receiver, an MP3-compliant six-disk CD changer and the Audi music interface that allows users to connect portable media players such as the Apple iPod and use the steering wheel-mounted multifunction controls. Plus, an optional sound surround amplifier by Bang & Olufsen (B&O), which is based on a SHARC processor executing filter algorithms that adapts the audio signals to the vehicle's interior acoustic conditions. From an embedded systems point of view, a major difference between automotive and other applications is the data communications buses. Typically, communication is via CAN or MOST bus. The controller area network (CAN) bus mainly serves as a control interface, with a data transfer rate of about 1 megabit per second (Mbps). Hence, it is not suitable for multimedia data transmission. The media-oriented systems transport (MOST) bus is used to transmit multimedia data in a digital format (raw PCM data) with a data transfer rate of up to 25 Mbps. The necessary MOST and CAN network services are implemented in software, and compliance with real-time requirements is ensured by the real-time operating system (RTOS). The multimedia system must also support standardized communication protocols, such as USB OTG, SDIO and Bluetooth. It must also support popular devices such as the Apple iPod and Microsoft's Zune player with the required proprietary protocols. USB memories and many different multimedia devices may be connected to the system as USB host. A PC could also be connected to the system as a USB device. As a rule, the USB and SDIO software drivers as well as the respective file systems are integral auto accessories of the operating system. In the future, wireless data transmission will play a special role, since this connection method is suitable for the transmission of audio and video data between portable terminal equipment and vehicles. Besides, the well-known profile for hands-free communication (hands-free profile or HFP), the Bluetooth protocol also supports a whole series of new profiles. One of these new profiles is the advanced audio distribution profile (A2DP, which enables the user to reproduce audio files located on a mobile phone via the vehicle's audio-system. A2DP enables compressed audio data, for example MP3 and AAC, to be transmitted using the wireless Bluetooth link. The AVRCP profile extends the A2DP profile. This profile enables the user to play back music that is located on a mobile phone. This typically includes start, stop, next track, previous track as well as the quick playback of a track. The profile also provides support for metadata. In the future, it will also be possible to display the title on the radio display, to enable the user to select the desired track or play lists via the central user interface. The dial-up network (DUN) profile is another important profile. This profile provides base station connection options to mobile phones and direct user access to the Internet. The data transmission speed depends on the transmission standard. 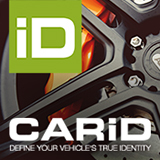 This means that a large number of new telematics functions are made available. In addition to pure communication support, the multimedia gateway also handles simultaneous decoding of several digitally formatted audio files that may employ digital rights management (DRM). In the future, two to three separate audio zones will be supported in a vehicle to meet the needs of all the passengers. What Car GPS systems do you like the most? Copyright © 2014 IPR Systems. All Rights Reserved.